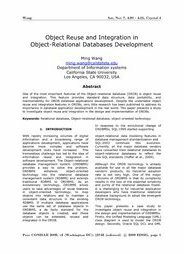 Recommended Citation: Wang, M. Object Reuse and Integration in Object-Relational Databases Development. In The Proceedings of the Conference on Information Systems Applied Research 2009, v 2 (Washington DC): §3743. ISSN: 0000-0000. One of the most important features of the Object-relational database (ORDB) is object reuse and integration. This feature provides standard data structure, data portability, and maintainability for ORDB database applications development. Despite the undeniable object reuse and integration features in ORDBs, very little research has been published to address its importance in database application development in the real world. This paper presents a study to investigate object reuse and integration in the design and implementation of ORDBs.